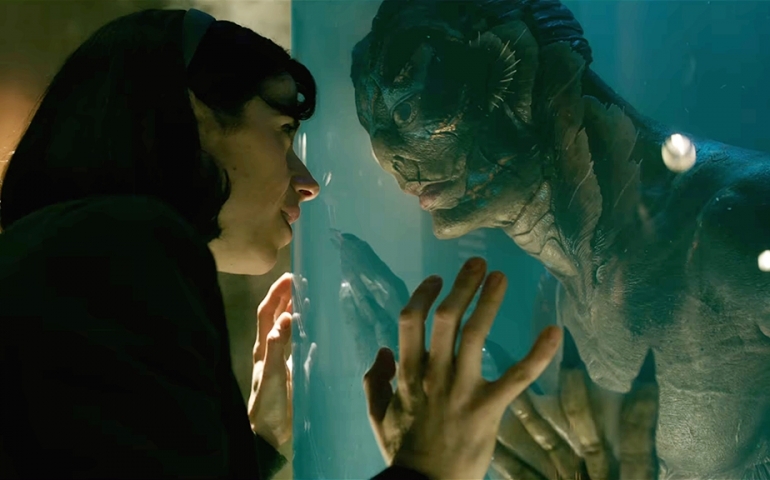 Guillermo del Toro’s The Shape of Water takes the viewer back in time. This story, set in Baltimore in the 1960’s, feels like a tribute to an old Hollywood science fiction movie. From the set, the lighting, the acting, to the music, this movie takes you to this other world, a world where a woman who is marginalized can find companionship from an unlikely source. Overall the details of this movie were thought-out and well done. With scenes where the main characters break out into a day-dream of dancing and singing or where the raindrops on the window follow the static electricity from the finger of our mute heroine, these scenes show the beauty interwoven into the film. This movie seems to give a voice to the voiceless. Having the main character as a mute woman, the movie does show a person who lives their life and goes beyond that to be the unlikely hero of the movie. The film shows a group of people, marginalized, that seemingly must look after each other because the people around them are not going to. Overall this unlikely love story is well done and worth the watch. A person who sees this film cannot help but ask themselves, “Am I going to be a person who will speak up for those who are marginalized?” The movie ends with a poem, speaking of the love between the unlikely couple, but in the end, it can give a new meaning to the name of the movie for the watcher: when one is immersed in water, like the water, love is all around and can come from uncommon sources. NOTE: This film is rated R, and may have content inappropriate for certain viewers. Please consult parental guides before you see it.